The chick which hatched this morning will hopefully have its first weigh-in this afternoon. Parents Nessie and Shackleton have been carefully tending to the egg throughout the incubation period and are now taking on the responsibility of providing for the chick. They will take turns feeding and sheltering the chick in their nest. The Deeps experienced team of Aquarists will keep a close eye on the chicks’ development, carrying out regular weight and health checks to ensure the parents are doing their job properly. During these checks we will be able to determine if it’s a boy or a girl. Katy Duke, Curator at The Deep said: “This is a very exciting, but nervous time for us. 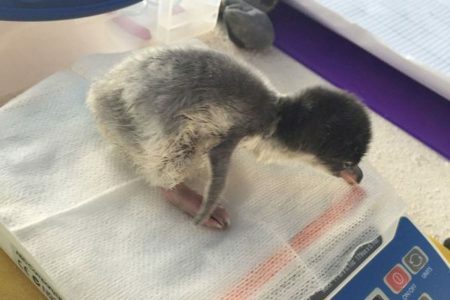 Penguin eggs can fail to hatch for a number of reasons, so to even have this one chick come through is a very proud moment. But now comes the real hard work, just like any new parent, raising offspring is a challenge, so we will be keeping a close eye on them to make sure everything goes as smoothly as possible. “As the chick begins to grow, so will its appetite. We will be undertaking additional penguin feeds throughout the day to make sure that both parents and chicks are getting their fill. Penguins don’t moult their soft downy feathers until around 3 months old. Until this time their feather aren’t waterproof so they rely solely on their parents to take care of them and keep them safe. From 3 months their waterproof feathers will begin to appear and the parents will encourage them to start swimming and fending for themselves.